The other day, a friend asked me not WHAT I do, but HOW I came to do what I do? Hmm, interesting question. If you believe in kismet, then you are halfway to understanding the fantastic ride that led me to my current profession. So let me fill you in on some of the background. I am an American lawyer who worked in a California law firm, before realizing that law firm life wasn’t for me. I moved to Paris to fulfill a dream of being a "human DOing" rather than a "human BEing." Had a bit of drama when I arrived in Paris not speaking French and not knowing French law, but everyone says ‘reach beyond your grasp’ and there you go. I went back to school to get an MBA and an MA in International Trade while learning the language, law and scoping out the job situation. My second year in Paris, I landed a job in a French subsidiary of an American company. I worked in their legal department for 3 years before moving on to an Internet conferencing company where I specialized in Internet law and new technologies. I became their General Counsel and stayed for several years. Then I had children – and my life completely and totally and irrevocably changed. I was always into human rights law and child protection, but nothing brought out the legal eagle in me like having my own two little beings to protect on the digital highway. I was a stay-at-home mom and part-time law professor and I gave child rights courses and Internet safety sessions where ever people would show up to listen to me. (And I still do). So in a nutshell, that’s what I do. I protect MY children. I empower parents to protect THEIR children. I want parents to understand that the Internet and digital technologies can be their friend - with reasonable screen limits. And I love it. 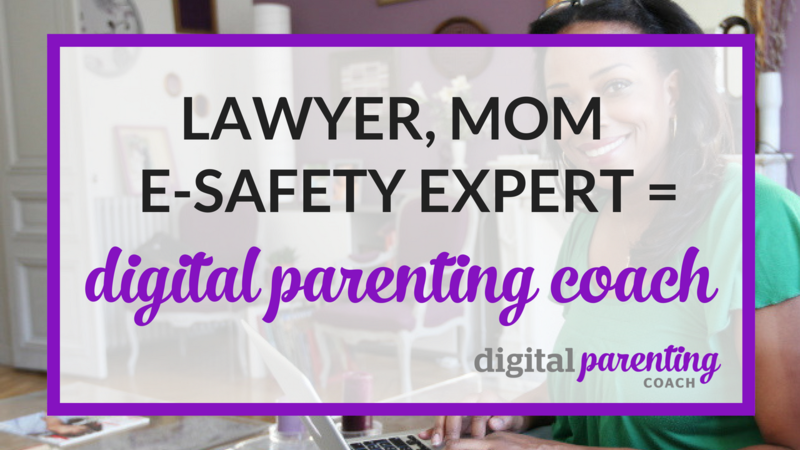 As a Digital Parenting Coach, my job and my passion, is to empower you in the digital environment, by providing reassurance and guidelines to help your children. Oh yea, and because I am a mother in the digital age, I am in the trenches with you. Gotta go now and get my iPad back.